Stay in one of the stunning bedrooms and enjoy a three course festive menu in their award-winning restaurant. Stays from £162 per couple, including accommodation, breakfast and three course dinner for two. Available on Friday 22nd and Saturday 23rd December 2017. Prices include accommodation, £30 allocation towards dinner per person on each night, breakfast and a copy of The Good Food Guide 2018. Book your 2 night New Year's Eve break from £715 per couple, including: New Year's Eve menu, a glass of fizz, live music, New Year's Day brunch, a goodie bag and, New Year's Day evening buffet. Or stay for three nights from £875 per couple, including all the above and our Early dining menu on the third night. See Tuddenham Mill for more information. The Westleton Crown is the perfect place to celebrate Christmas and New Year and enjoy the warmth and charm of a traditional Suffolk coaching inn. Join us for a fantastic evening to ring in the New Year with a celebration dinner, Champagne and festive treats on arrival, followed by live music and hopefully a little dancing too. Our 2 night package prices from £550 per couple. See The Westleton Crown for more information. Take the stress out of Christmas and New Year by booking a break in Suffolk and letting one of our fabulous Suffolk Hotels do all the hard work for you! 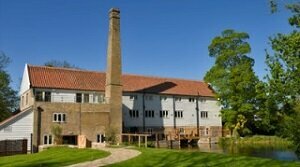 Spoil yourself this Christmas by booking a stay at the impressive Tuddenham Mill close to Bury St Edmunds. This former watermill is now a beautiful modern hotel and restaurant. With plenty of original features and style, the luxury bedrooms and award winning food offer an excellent Festive retreat. At Tudeenham Mill you can enjoy a two or three night package (starting at £820) for you to celebrate, relax and enjoy award-winning food, plus a little pampering. And as you probably won't want to leave.... good news, you can spend New Years Eve there too! Two nights from £725 per couple, which includes accommodation with breakfast, New Year's Eve menu, a glass of fizz and entertainment, The Mill's hangover goodie bag, New Year's Day brunch and evening buffet. 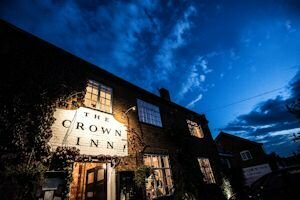 Party the night away at the friendly Westleton Crown, close to the Suffolk Coast. There's always a warm welcome here and New Years Eve is bound to be a lively evening with a great atmosphere. Join the Crown for a fantastic evening with a celebration dinner, Champagne and festive treats on arrival, followed by live music and hopefully a little dancing too! All for £85 per person. Or why not go the whole hog and enjoy a 2 night break from £465 per couple, including breakfast as well as the New Year's Eve Celebration? See The Westleton Crown for full information. Oakleys Cottage are now offering a New Year Break from 5 nights onwards arriving Friday 29th December. An ideal opportunity to snuggle up beside the huge inglenook fireplace and recouperate from the festivities. See Oakleys Cottage for more information on this charming fifteenth century cottage. 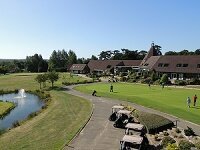 Festive charm and entertainment at Stoke-by-Nayland Hotel Golf & Spa including a free round of Golf on Christmas Day! Enjoy a bit of festive pampering with a selection of 2, 3 & 4-night breaks this Christmas, including food, entertainment and much more at Stoke by Nayland, Spa & Golf Hotel. Set in acres of beautiful Suffolk countryside. This 4 star friendly hotel is guaranteed to keep everyone happy with Christmas Breaks from £122pppn. - and tickets to see Irie J (a fabulous soul singer) on Boxing Day! Situated close to Woodbridge, Sutton Hoo, Framlingham Castle or the coastal towns of Aldeburgh or Southwold, this contemporary hotel makes a great base from which to explore Suffolk. Enjoy a Winter break, a game of golf or relax in the Spa before the madness of Christmas sets in. £65* room only or £75* bed and breakfast. Available from 1st November, Sunday to Thursday only (Excludes 24th, 25th, 26th 2016) *Terms and conditions apply. If you would like to spend Christmas at Ufford Park, please see Ufford Park, Woodbridge for full information and a link to their website. Please let us know about your best Christmas or New Year Break in Suffolk by writing a review and Sending Us an Email!